This study offers a holistic reading of Job and its depiction of creation and evil, finding significant clues to its meaning in the striking imagery it uses. Fyall concludes Job is not so much about suffering per se, as about creation, providence and knowing God in the crucible of suffering. 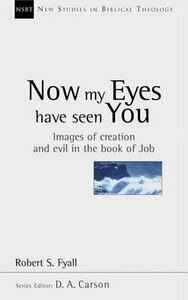 About "Now My Eyes Have Seen You (New Studies In Biblical Theology Series)"
This study offers a holistic reading of the book of Job, with particular reference to its depiction of creation and evil, and finds significant clues to its meaning. The Revd Dr Robert Fyall is Senior Tutor in Ministry for the Cornhill Training Course, Scotland. He was formerly Director of Rutherford House, Edinburgh, minister of a parish church in Scotland, and pastor of a large student church in Durham, where he also taught Old Testament at Cranmer Hall.